While comic book fans descended on New York City for NYCC this past weekend, we had our own little comic show here in northern Virginia. The Shoff Show comes around every few months, and I’ve been going to it fairly often lately — I’m a sucker for the bargain bins. There is one dealer who brings dozens of long boxes with comics priced from 75 cents to five bucks. This is where I spend most of my time (and money) — there is treasure to be found, you just need to dig for it! While sifting through some boxes, I chatted with a couple of dealers about the show’s attendance and how it was surprisingly good, even though Baltimore Comic Con was last weekend, and AwesomeCon wasn’t too long ago. Despite that optimism, they were acutely aware that there are hardly any young comic buyers — most of their customers are old dudes like me. They commented that Millenials have never been exposed to comic books in their paper format, and the future of the comic industry is bleak at best. I guess that makes sense, but I hate to think it’s true. I’m not deeply involved in the comic scene, but I would imagine that this is a common lament among collectors and sellers. 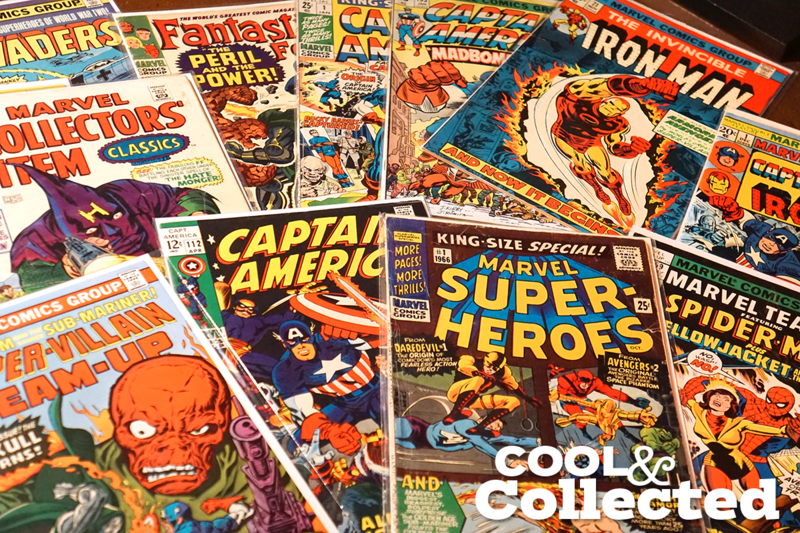 Is there a future for comic book collecting? It’s true that kids these days are nowhere near as attached to “stuff” as their parents. My kids and their friends collect and trade Pokemon cards, but that’s about it. They use their electronic devices to read books, play games, watch movies, and communicate with one another. If there’s one thing they will look back on as adults, it will be the time they spent with their iPads. sigh. Collecting is as strong as ever in kids, but the things they collect are digital items found in video game loot crates — the physical aspect doesn’t seem to be necessary. What do you think, will these kids eventually grow up to appreciate and collect physical objects, or will they be surrounded by nothing but piles of obsolete electronic devices? Do your kids have an interest in reading and collecting physical copies of comic books? Add your thoughts in a comment below. While I can kind of see the benefits of digital comics, I will ALWAYS buy actual comic books. I don’t wan’t to require electricity to read a comic. I like the feel of a comic book in my hand. The fun of going to my local shop to find it. That being the case, I’ve only ever shown/bought my kids actual comic books. As far as kids these days and collecting, I would argue that a big part of the problem is the industry itself. Comics: While kids are very aware of who popular superheroes are, many of them have never set foot in a comic book store before. I’ve been saying this for years. They need to setup a small comic rack in stores like TRU, Target and Walmart. It would have a small sampling of current (kid-friendly) titles and a link posted on the rack somewhere, for comicshoplocator.com. This would give them some exposure and let them know where they could find more. I also feel like they don’t push the classic material enough, which (in most cases) is inherently more kid friendly. They can graduate to the more adult stories later. Bottom line is that the big boys (Marvel & DC) are doing almost NOTHING to get young kids interested in comics. They’re too busy pushing movies, toys and cartoons. Trading cards: The quality of comic-related trading cards is ‘in the toilet’ and has been for some time. The price has gone way up and the quality of the cards (art & info) has gone way down. The pinnacle of these cards was the late 80’s and early 90s. Great original art, character stats, bios, trivia and like 10-12 cards a pack, for a $1.50. Ben, you sound like a fellow old dude. 😉 I agree 100% with the fact that today’s comics aren’t too kid-friendly — I have tried many times to find something appropriate for my boys to read, but always resorted to a TPB from an old storyline. I bet that many kids have only seen comic book characters in media other than comic books (movies, TV, video games, etc.). Around here, Toys R Us carries some comics, but they are usually scattered around and in rough shape. I suspect that the price of comics is a major reason for people not buying them, but I don’t buy new books anymore so I am not the best judge. It’s probably not feasible to even suggest, but what if comics cost a buck — the same cost as a Hot Wheels car — and were sold in the toy section of stores? I know that my kids would definitely have a stack of comics in their room if this was the case. On a more uplifting note, I brought a box of old beater comics to a recent cub scout gathering, and the boys were crawling all over each other to get their hands on them, so the desire is there! The desire is definitely there. Just need the industry to work harder at bringing in new readers. Look at the massive success Topps is having with digital Star Wars cards. It seems millenials are content to spend their money on all things digital with no concept of tangible goods. They don’t buy DVD’s. They watch Youtube. They don’t read books. They surf the web. Collectors are dying breeds. Soon everyone’s “stuff” will be digitally admired through goggles as we live through AI. Yep, and many don’t buy cars, bikes, or houses either. It’s going to be interesting to see how this “sharing economy” is going to work out in the long run. My son fortunately despite the challenges of the modern digital threats, still prefer hardcopies of books and comics in his hands. The little man knows how to roll like a true old school collector/reader! Being in and out of the comic industry over the last 30+ years, I’ve seen it explode an implode. I agree in that there isn’t enough exposure anymore. You just can’t find comics on comic racks at 7-11 anymore. Then there is the cover price. $2.99 – $4.99 for a single issue? Show me a 10-year old (the age I was when I started collecting) that has $5 to spend on ONE book and has the means to get local comic shop (LCS). And then there are the TPBs. If you wait a few months, you can get the entire story arc (between 5-7) in one bound volume for about 60% the original cover price. And if you wait a few more months, you can get it digitally for about 50% off the original cover price. Sorry, I didn’t mean for this to be rant and go off on a tangent. I will say this, I take my 2yo daughter with me every time I go pick up my books at the LCS. And last week I bought her her first comic book. Took her over to the child friendly section and she choose her own book. She grabbed a My Little Pony comic first. Then saw a Captain America book and put down the Pony book. Then she saw a SpiderMan digest and got super excited. And that what she went home with. Oh, and she loves the Hulk. I’ll keep buying books but the more expensive they get, the less books I’ll buy. I couldn’t agree more with everything you said. The only exposure my kids have to comics is through the TPBs. I’m hopeful that they will grow to appreciate the act of collecting comic books when they get older, but I’m just not seeing the spark yet.